Aston Martin is highly regarded as one of the best car manufacturers ever created. It is the epitome of British motoring and is always pushing the envelope with performance and style innovation. Therefore, the Aston Martin Rapide is a true supercar offering style and performance at maximum levels, a thrilling driving experience and plenty of comfort and equipment. It has four doors and can be picked up for a great price from the range of used Aston Martin Rapides for sale at RAC Cars. 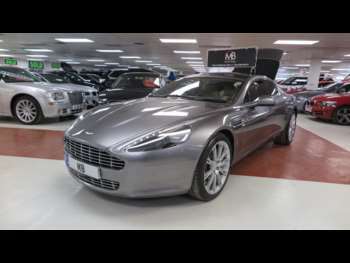 The Aston Martin Rapide is first and foremost a sports car, with Aston’s familiar 6 litre V12 power unit under the bonnet. Climbing into the cockpit, it is similar to the DB9, from the competition style instruments to the aluminium block which passes for a key. Being a sports car rather than a luxury saloon, the 470 bhp engine will take you from start to sixty in five seconds and on to 100mph five seconds after that. If you get one out on the track, the top speed is 188mph. This car also has all of the usual Aston Martin refinements, including hand-stitched British leather, walnut panelling and Iridium Silver detailing. There is individual air conditioning for each of four passengers, who are ensconced in their own cockpit with sports seating and a full Aston Martin environment. Aston Martin is very keen that you understand this is a sporting supercar, which happens to have four doors, rather than a luxury saloon, and the performance figures back that up. A 0-60 time of just five seconds is excellent on a four-door car and it’s not all about super quick performance. Throw the Rapide into a corner and you’ll find it is responsive and almost perfectly balanced, with that big V12 engine pushed back under the bonnet to give almost perfect front to rear weight distribution. Explore our used Aston Martin Rapides to find the perfect model for you. Got a specific Aston Martin Rapide model in mind?